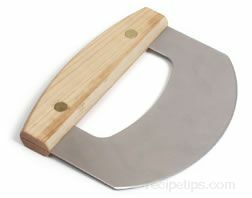 A wooden utensil made from a hardwood such as maple that is used as a chopping or cutting surface when preparing delicate and small ingredients, such as fresh herbs. 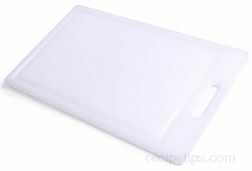 Mincing Boards are produced with flat or curved surfaces and most often will have rubber pads on the bottom to keep the board from sliding as it is used. The flat surfaced boards typically are best suited for straight-edged mincing blades, but can also be used with curved blades on mincing knives such as a mezzaluna. 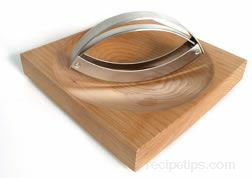 Curved or concave surfaced boards are only used with the single or double-bladed mincing knives, which fit nicely into the rounded cutting surface. 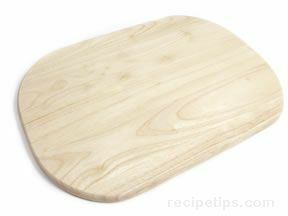 Some Mincing Boards are designed with an indented lip that allows a plate to be placed beneath the board surface so the chopped contents can be easily pushed off the board and into the plate. A mincing board may also be referred to as an herb cutting board.